Annual conference at the Southwest College of Naturopthic Medicine in Tempe, Arizona. Topics include menopause, treatment of fungal infections, vulneraries, treatment of hypertension, cellular receptors, herb-drug interactions, treatment of kidney stones, preparing for surgery and much more. 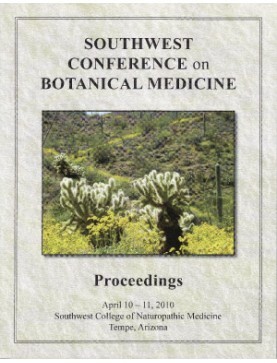 2010 Southwest Conference on Botanical Medicine: Conference Book. Order download of PDF f..
Full Set of Southwest Conference on Botanical Medicine MP3 recordings includes these titles (each ab..
Speaker: David Crow. Taking Medicine to the People..
Speaker: Paul Bergner. Botanicals for Surgery..
Speaker: Deborah Frances. Pelvic Decongestant Herbs..
Speaker: Martha Burgess. Hydrosols: Distilling the Essence of Desert Aromas..
Speaker: Rosita Arvigo. Herbs of Belize..
Speaker: Donald Yance. Continued from Part 1. Cardiovascular Blood Markers and Botanical Therap..
Speaker: Donald Yance. Cardiovascular Blood Markers and Botanical Therapies, Part 1. Continued ..
Speaker: David Crow. Cosmic Chemistry..
Speaker: Amanda McQuade Crawford. Natural Menopause..
Speaker: Deborah Frances. Botanicals for Fungal Infections..
Speaker: Rosita Arvigo. Spiritual bathing techniques from a variety of cultures are described s..
Speaker: Rosita Arvigo. Keynote Address: My Years with a Maya Shaman..
Speaker: Deborah Frances. Plants as Teachers: Iris and Baptisia..
Speaker: JoAnn Sanchez. Therapeutic Benefits of Traditional Herbal Pairing..
Speaker: Rosita Arvigo. Introduction to Maya Abdominal Massage..
Speaker: Paul Bergner. Healing: Herbs for the Spiritual Heart..
Speaker: David Crow. Aromatic Stars..
Speaker: Rhonda PallasDowney. Calendula: Medicinal Herb, Homeopathic Remedy and Flower Essence..
Speaker: Amanda McQuade Crawford. Obesity - Beyond the Conventional Approach..
Speaker: Paul Bergner. Celiac Disease: Withdrawal and Recovery from Gluten Intolerance..
Speaker: Amanda McQuade Crawford. Continued from Part 1. Alternatives to statin drugs, the HPV vacci..
Speaker: Amanda McQuade Crawford. Alternatives to statins drugs, the HPV Vaccine, antidepressants an..